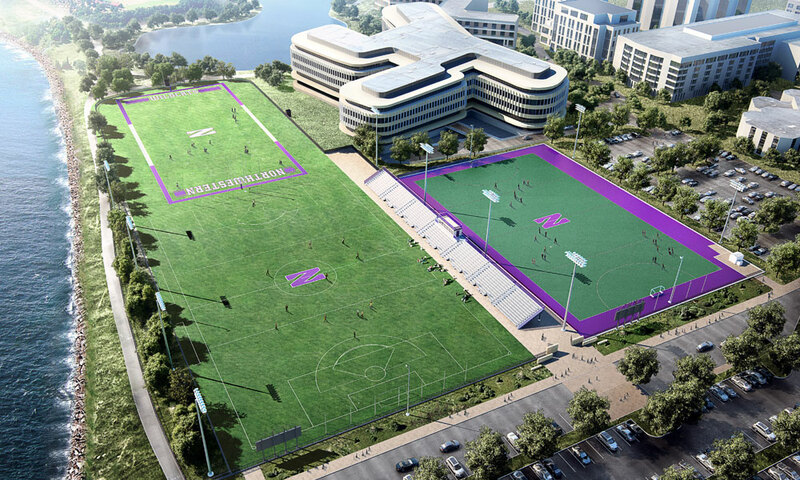 EVANSTON, Ill. -- Northwestern University broke ground on the next phase of its new Lakefront Athletics and Recreation Complex in a ceremony held Saturday, April 25, for Lanny and Sharon Martin Stadium. The renovated soccer/lacrosse field will be named for Northwestern alumnus and trustee J. Landis (Lanny) Martin and his wife, Sharon Martin, in recognition of their generous support of the project. Important donors to Northwestern for more than 30 years, the Martins are co-chairs of We Will. The Campaign for Northwestern and have committed $15 million to support Northwestern's campaign for athletics and recreation. "Lanny's and Sharon's passion for Northwestern is reflected both in their own gifts and their fundraising leadership," Northwestern President Morton Schapiro said. "We are very grateful for their generosity and the central roles they play in the life of our University," President Schapiro added. "Their contributions are advancing our ability to provide our students with the best possible experience at Northwestern, academically, socially and athletically." A key step in the development of the athletics and recreation complex, the groundbreaking ceremony also celebrated the beginning of construction for Chap and Ethel Hutcheson Field, a brand new outdoor football practice field that will also be used for intramural and club sports, to be built just south of Martin Stadium, as well as the renovation of a field hockey field that will include new artificial turf. "Lanny and Sharon have provided a critical foundation for reaching this construction phase for Lanny and Sharon Martin Stadium and the entire complex, their generosity is truly incredible," said Jim Phillips, vice president for athletics and recreation. "This is the latest step in a transformational project for our entire University community. The renovation will provide a superior training and competition venue and allow us to continue to deliver a world-class experience to our nearly 500 student-athletes." Lanny and Sharon Martin Stadium will be used for competition by Northwestern's men's and women's soccer and women's lacrosse teams. "Lanny and Sharon Martin Stadium is part of a project that, when complete, will truly elevate the experience of every student-athlete at Northwestern," said Nandi Mehta, junior co-captain of Northwestern women's soccer, who spoke at the groundbreaking ceremony. "Words cannot describe what their gift and lifelong commitment to the University means to us and the impact it will have on future generations of Wildcats." Mehta was named Big Ten Distinguished Scholar in 2013, and this January she was chosen as a representative for the Big Ten Conference in the NCAA autonomy process. She is one of three student-athletes selected to represent her nearly 9,500 Big Ten peers in that position. The Martins' support of Northwestern also has included creating the J. Landis Martin Professorship of Law and Business as well as generous gifts to the Law School Fund and the Bienen School of Music Fund. The new football practice field, Chap and Ethel Hutcheson Field, will be named in honor of the Martins' longtime friend and associate Edward C. Hutcheson, Jr. (Chap) and his wife, Ethel. A managing director of Platte River Ventures, a Denver-based private equity firm, Chap Hutcheson has served for the last two decades in senior management positions with publicly owned corporations in the telecommunications, financial services and oilfield services industries. Lanny Martin, a Northwestern University trustee, received his B.S. in business from Northwestern in 1968 and his J.D. from Northwestern University School of Law in 1973. While in law school, he served as an editor of the Northwestern University Law Review. Martin is founder and managing director of Platte River Equity in Denver. He founded the firm in 2005 after spending more than 18 years as CEO of industrial, chemical and metals companies. Prior to launching Platte River Equity, he was chairman and CEO of Titanium Metals Corporation. He also served in the U.S. Army. Martin was inducted into the Colorado Business Hall of Fame in 2012. In 2010, he was honored with the Josef Korbel Humanitarian Award for the many significant philanthropic contributions he has made to the Denver community. Sharon Martin earned her B.A. from Denison University, where she served for a decade as a trustee. Sharon has been a leader in the Denver arts community for more than 30 years. She and Lanny Martin have three children (Mary Lester; Sarah Stettner, who received an undergraduate degree from Northwestern in 2002 and a J.D. from the School of Law in 2007; and Emily Martin, who received degrees from Northwestern University Feinberg School of Medicine in 2008 and 2011) and four grandchildren. In fall of 2012, Northwestern announced plans to replace an existing athletics and recreation facility with a larger building that will provide an indoor multipurpose facility to be used for football practice as well as other athletic team practices and competitions, recreational activities and non-sporting events. In the fall of 2014, Northwestern opened a major expansion of the Henry Crown Sports Pavilion that includes new fitness studios, a room with new weights and exercise equipment and related facilities. The facility provides exercise and recreational space for students, faculty, staff and members of the community who join the sports and aquatics center. At the same time, the University opened a new sailing center on the south end of the Evanston campus, providing greatly improved facilities for students and local residents who are members of the Northwestern University Sailing Center. Work will begin this spring on the soccer/lacrosse field, now named the Lanny and Sharon Martin Stadium, the field hockey field and a new outdoor football practice field, now named Chap and Ethel Hutcheson Field, that also will be used for intramural and club sports.